Are you a petite mom and wondering which stroller would be comfortable for you to push without wrist fatigue? Or maybe you’re very tall and can’t stand your old stroller because you have to slouch over it? Maybe your partner is much taller/shorter than you and you need a stroller that would be convenient to steer for both of you? Don’t worry, I’ve got your back. Here are my detailed recommendations for short, average and tall parents. Let me start by saying that there are two types of strollers: with adjustable handlebar and non-adjustable handlebar. The latter one is typical rather for cheap models, lightweight and umbrella strollers, and old strollers (designed few years ago). Adjustable handlebar also comes in two types: one adjusts by rotation, the other one extends by sliding out. The latter type is great for very tall people with long legs. Thanks to extendable handlebar they push the stroller without walking too close to it and without kicking the rear axle. I’m quite a short and petite woman (about 5’2″), while my husband is more… chunky 🙂 (he’s 6’2″). Choosing a stroller that would be easy to push for both of us was quite difficult. If the stroller doesn’t have adjustable handlebar and is comfortable for me, my hubby has to stoop and his back hurts. If the stroller is convenient for him, it’s too tall for me and my wrists and forearm hurt. For us the only solution was adjustable handlebar. If you have similar issue, you’ll find the solution in this article. Below you’ll find the best strollers with adjustable handlebar for parents of different heights, just like us. I also prepared a list of strollers with non-adjustable handlebar that are most comfortable for tall parents and list of strollers for short parents. What is the best stroller for petite mom (and dad)? What is the best stroller for average in height parents? What is the best stroller for tall parents? If you’re less than 5’4″ you have two options: stroller with handlebar that is not very high from the ground (I’d say max. 39-40″) or a stroller with adjustable handlebar with wide range of height settings. Below I present the best strollers for short parents, both with adjustable and non-adjustable handles. Among standard and convertible strollers the best for short parents are Evenflo Pivot Modular and Chicco Viaro (both have handlebar at about 40″ from the ground), but only for those who are 5’2″ and taller. If you’re shorter than 5’2″ you will probably experience wrist pain. If you’re short and want a convertible stroller I would recommend you getting a model with adjustable handlebar for your convenience. The choice is vast. In my opinion the best choice is Baby Jogger City Mini GT and Cybex Balios S – if you need a stroller that can handle multiple types of terrain. The former one has handlebar that rotates from 30″ up to 43.5″, while the latter one has extendable handlebar that telescopes from 39 up to 43.5″. Other good strollers for short parents for city use are: Chicco Bravo and Nuna Mixx2. If you’re thinking about getting an expandable stroller then Baby Jogger City Select LUX and Bugaboo Donkey are good choices for short parents. Both have telescoping handlebars, the former one extends from 38.5″, while the latter one starts at 32″ from the ground. The best lightweight stroller for short moms and dads is GB Pockit Plus that has two stationary handles. The handles begin at 37″ and end at 39″ from the ground. If you’re a petite mom like me (5’2″) pushing this stroller will be convenient for you. It’s comfortable also for very short parents like 4’10”. But if you’re 5’5″ or higher you’ll be slouching over the handles which may lead to neck and shoulder pain (unless you have really long arms…). Baby Jogger City Tour and Mountain Buggy Nano are also good option for short parents. Best jogging stroller for short moms with non-adjustable handlebar is BOB Rambler (39″ from the ground). However, if you plan on jogging frequently I’d recommend you getting a jogging stroller with adjustable handlebar. This way you avoid wrist and back pain which could be really annoying during running. All BOB Revolution strollers with rotating handlebar would be good for short parents (for example BOB Revolution FLEX and PRO). The handlebar on these strollers goes from 33.5” from the ground and offers 9 settings so you will definitely find the most comfortable position for you. Thule Urban Glide and Bumbleride Speed are short parents friendly as well (handlebar lowest setting is about 35” from the ground). If you are a short mom or dad and need double jogging stroller you should definitely check BOB jogging strollers with adjustable handlebar (for example PRO, FLEX or IRONMAN). Double strollers usually have quite tall handlebars. Therefore for short parents I would recommend double buggy only with adjustable handlebar. Both Baby Jogger City Mini GT and Mountain Buggy Duet have good rotating handlebars with wide range of height settings (the former one goes from 30″ up to 43.5″, while the latter one rotates from 31″ up to 42″). The lowest setting allows even an older sibling to push his little brother or sister. Here are my recommendations for parents who are 5’5″-5’11” tall. The best standard & convertible stroller with non-adjustable handlebar for average parents is Britax B-Agile. Its handlebar is set at about 40.5″ from the ground. Other good choices are: Graco FastAction Fold Travel System and Graco Aire3 Click Connect. Majority of standard strollers with adjustable handlebar are comfortable to push for average in height moms and dads (for example Cybex Balios S, Baby Jogger City Mini GT, UPPAbaby CRUZ, Britax B-Free, Chicco Bravo or Peg Perego Booklet). Whether you’re 5’5″ or 5’11” all expandable strollers will be convenient for you to push. The best one would be probably UPPAbaby VISTA with telescoping handlebar (height settings ranges from 39.5″ up to 42.5”). 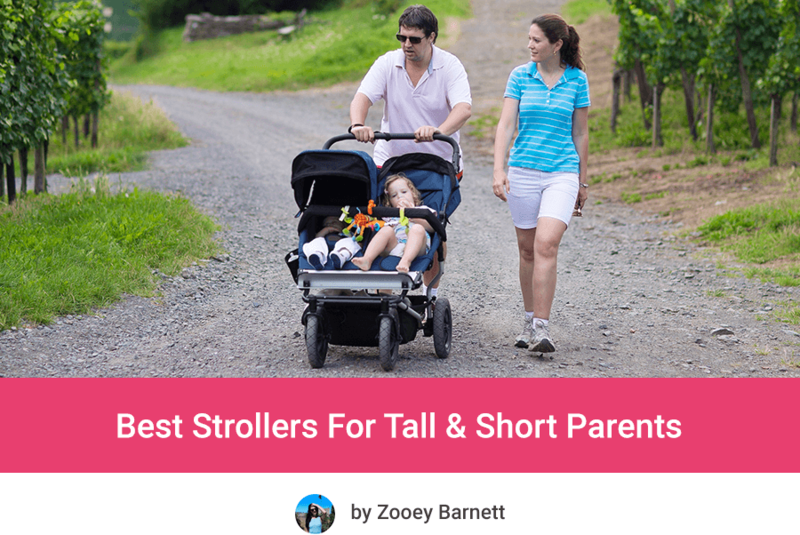 The best lightweight stroller for average in height parents is Baby Jogger City Tour LUX (for those who are closer to 5’5”), UPPAbaby MINU (for those who are closer to 5’8”), as well as Chicco Mini Bravo and Mini Bravo Plus. These strollers have single, stationary handlebar. BABYZEN YOYO+ is also a good choice for parents of average height (better for those who are 5’8″-5’11” than 5’5″ though). The handlebar is 42 inches from the ground. Although you can read in customer reviews that short parents use this stroller as well, it’s definitely less comfortable to push for someone who is 5’1″ or even 5’4″ than 5’10”. On the other hand, some parents say that YOYO+ is only for tall parents. It’s not true either. The handlebar is quite tall but it’s also more upright than handlebars on other strollers which means that when you push BABYZEN YOYO+ you’re really close to the back of it. Tall parents find it less comfortable, because they kick the rear wheels and rear axle. That’s why I would recommend BABYZEN YOYO+ stroller only for parents of average height. Among jogging strollers with non-adjustable handlebar good choice for moms and dads of average height are Baby Jogger Summit X3, Joovy Zoom 360 Ultralight and Baby Trend Expedition. All other joggers that have adjustable handlebar (for example from BOB Revolution or Thule) would suit them as well. The best double strollers for average in height parents with non-adjustable handlebar are Baby Jogger City Mini Double or Graco DuoGlider. Double buggies with adjustable rotating handlebar like Baby Jogger City Mini GT Double, Mountain Buggy Duet or Chicco Cortina Together will be comfortable too. If you are 6ft or taller you’ll need a stroller with adjustable handles. The best choice would be a stroller with extendable handle, because it will give you more space behind the stroller and you won’t kick the back of it. If you’re about 6’2″ stroller with non-adjustable handlebar could work too, but it has to be set high from the ground (at least 41 inches). If you’re taller adjustable handlebar is a must have. If you want a standard, convertible stroller with unadjustable handlebar, the best choice is Baby Jogger City Mini (41.5 inches from the ground). If you’re really tall (above 6’2″) adjustable handlebar is better solution, for example Cybex Balios S and UPPAbaby CRUZ. They have telescoping handlebar which is more convenient for tall users. Bumbleride Indie is a great option too, despite rotating handlebar. It goes up to 45.5″ so it’s convenient even for those who are above 6’5″! The best expandable stroller for tall parents is Baby Jogger City Select – its handlebar telescopes up to 43″. City Select LUX is good option too, even 6’8″ tall parents use it! The best umbrella stroller for tall parents is UPPAbaby G-LUXE. It has two separate, L-shaped handles which are about 42-43” from the ground. Lots of customers say these handles are very tall and convenient for people over 6ft tall. Summer Infant 3Dlite Convenience Stroller (42”) is quite good too, especially if you’re looking for a cheap umbrella stroller for tall parents. You probably wonder if there is an umbrella stroller with adjustable handles that would be comfortable for tall parents. Frankly, this is a rare feature among lightweight strollers! Only few models have it. Maclaren Techno XT is one example of umbrella stroller with adjustable handles. Another option is Maclaren Techno XLR. Both these strollers are quite expensive (check price for Maclaren Techno XT and Techno XLR). But since they have extendable handles they are very convenient to push for parents above 6ft tall. It is noteworthy that the new version of Maclaren Techno XLR for 2018 has single handlebar instead of two handles. It has few height setting therefore this is another tall parents friendly umbrella stroller with adjustable handle (read more about the features). You may want to consider Peg Perego Pliko Mini as well. It weigh only 13 lbs so it’s a really lightweight stroller with adjustable handles. If you want to learn more about it and check its availability at Amazon click here. If you have small budget and need a jogging stroller, you will probably have to choose a model with non-adjustable handlebar. There are two models that have quite tall handlebars: Baby Trend Expedition Jogger Double and Graco Fastaction Fold Jogger Click Connect (both set at 42 inches). I think jogging stroller with adjustable handle is better choice for very tall parents. There’s one Graco stroller with adjustable handle that you can run with: Graco RoadMaster. Thule Urban Glide handle goes up to 44”, Bumbleride Speed up to 46”, BOB Revolution Flex and PRO up to 48.5”. The tallest handlebar you can find is on BOB IRONMAN Duallie – it goes up to 51 inches from the ground! Among double strollers for tall parents we have Joovy Caboose Ultralight (stationary handlebar set at 42”). If you want something with adjustable handle height choose Baby Jogger City Mini GT or Chicco Cortina Together. Keep in mind that these strollers have rotating handlebars. If you want a stroller with extendable handles, check expandable models (UPPAbaby VISTA or Baby Jogger CIty Select LUX). As you can see strollers with adjustable handlebar are more versatile and suit parents of different heights. So if your partner is much taller/shorter than you, adjustable handlebar will be very useful for you. Have you already narrowed down your choice to few models and now you wonder which stroller will be most comfortable for your height? Or maybe you’re looking for a information about handlebar height on a specific model? Below I gathered information about the most popular strollers in 2019 and their handlebars. I hope it will help you to narrow down your choice and make decision. Here you can see the most popular standard and convertible buggies for everyday use. These strollers convert into travel system and/or have option of attaching bassinet. Here are the most popular strollers that you can expand from a single to a double mode. This is the list of strollers that weighs less than 20 lbs. Here you can find information about handlebars on strollers that are suitable for running. Are you having twins? Or maybe you need a stroller for a newborn and a toddler? Here are the most popular double strollers. This is the most thorough, well-researched list I’ve found. Thank you so much for compiling all of this in one spot!